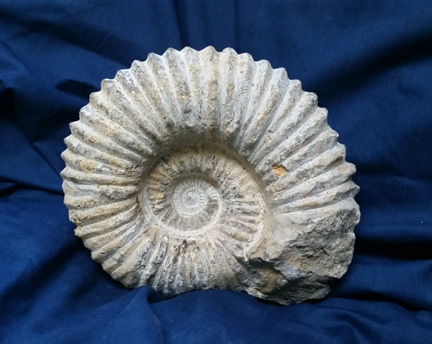 This superb grade ammonite is solid stone featuring the fascinating ridged surface of the ancient creature's shell and was excavated from the coastal Moroccan village of Agadir. Ammonoids evolved from nautiloids in the early Devonian period, about 400 million years ago. They were abundant in world seas for the next 370 million years. They suddenly vanished at the end of the Cretaceous period. Now 3 sizes to choose from!!! Small fossils measure approximately 2" to 3" across, medium measure approximately 4" to 5" and large fossils measure 6.5" to 8" across.